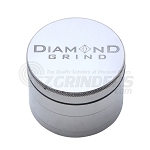 The Large Ergo Grinder 4 Piece is a durable herb grinder that is named for it's ergonomically designed lid that offers a superior grip for easy grinding action. A micro-ribbed finish combined with this grinder's substantial amount of teeth makes shredding through a chamber full of material as simple as can be. After grinding your material falls through the strategically placed drop through holes to be stored on top of a stainless steel sifting screen for filtering. This screen will separate pollen from your ground herbs for easy collection. A standard mesh screen is included but a silk or coarse mesh screen can be purchased separately to swap out and customize your pollen collections. Often sifting screens become caked up after time, resulting in a decrease in your pollen collection. To help fight this Ergo implements a removable screen that is held in place by three magnets and only requires two fingers to be removed for a quick and simple cleaning process. 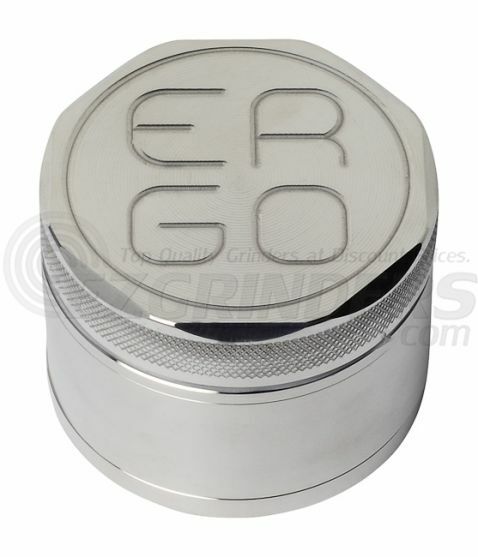 A set of neodymium rare earth magnets hold the Ergo grinders top two layers together, this will prevent any material from falling out after imminent drops or falls while also creating a near airtight closure to keep any material inside from drying out too quickly. The Large Ergo Grinder measures in at around 3" in diameter or about 75mm, leaving you with a grinder that is perfect for home use.